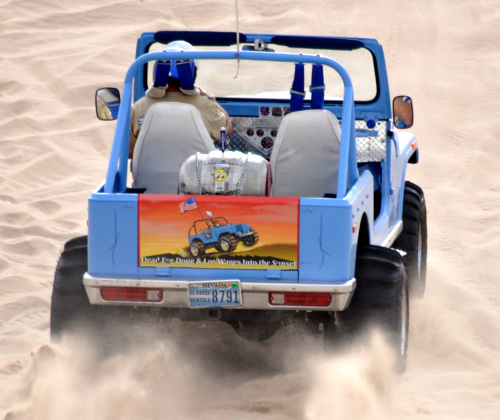 The Las Vegas Jeep Club hosted their 42nd Annual Jeep Jamboree over President’s Day Weekend at the Dumont Dunes in California. 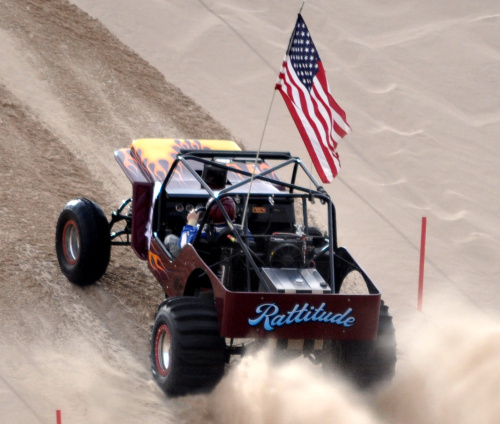 This unique event features a Hill Climb on Saturday followed up by the feature 300’ Sand Drags on Sunday. 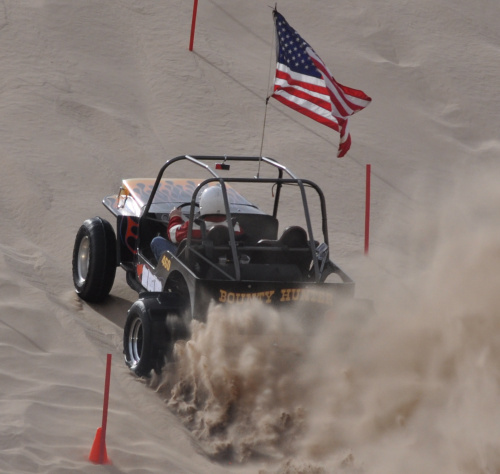 President’s Day Weekend is always big at the Dumont Dunes, so this event always has a ton of eyes on it from the Sand Sports community. 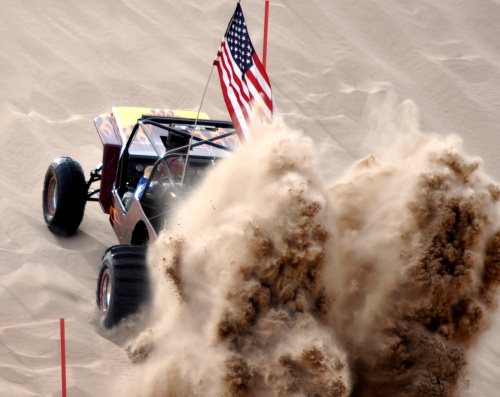 This year was no exception with huge crowds taking in the action throughout the weekend. Let’s take a look at the action. 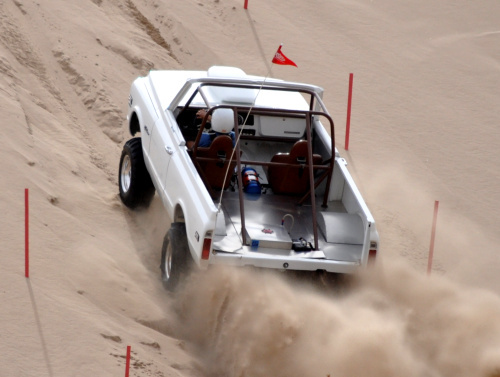 The Sand Drags portion of the event takes place on the flats between the dune riding zone and camping area. 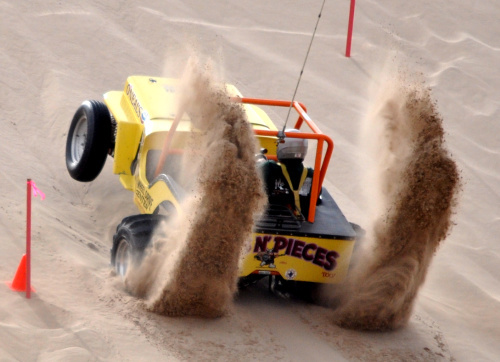 The Las Vegas Jeep Club crew puts for a huge effort to effectively set up a temporary sand drag track for the weekend, and then take it all down at the end of the weekend. 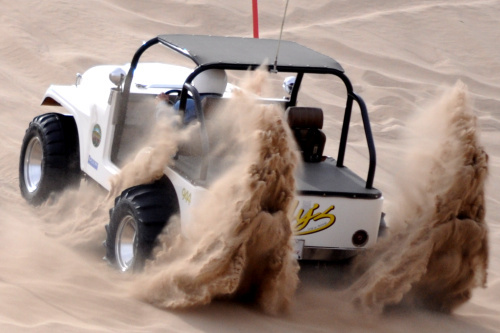 It’s amazing to see the sand smoothed out quickly and groomed into a great racing surface. This event features a mix of traditional Heads-Up classes along with a selection of Index classes added for the first time this year. For this year, several of the Heads-Up classes were combined to cultivate more competitive classes and it did not disappoint. 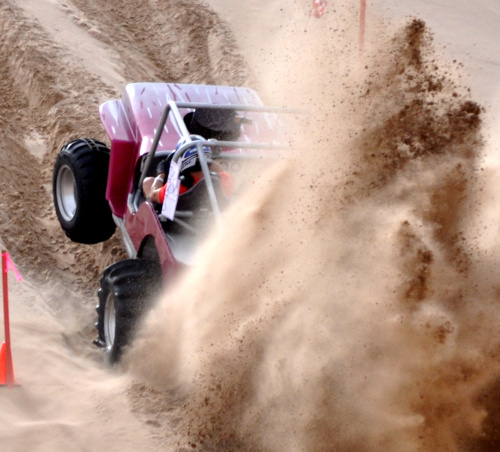 In the headlining Pro Drag class, carnage was a big factor. 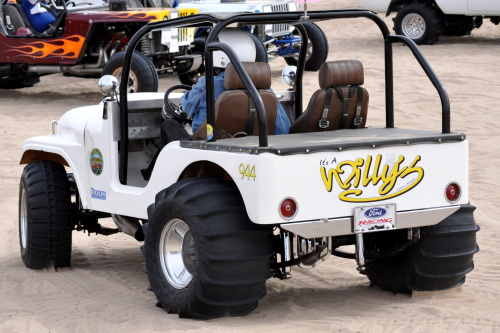 Wes Gilmore laid down some nice passes with his Blown BBC “Born to be Wild” Jeep as did Mike Smith in the Blown SBC “Arachnophobia” Jeep, but both had mechanical problems taking them out of action. 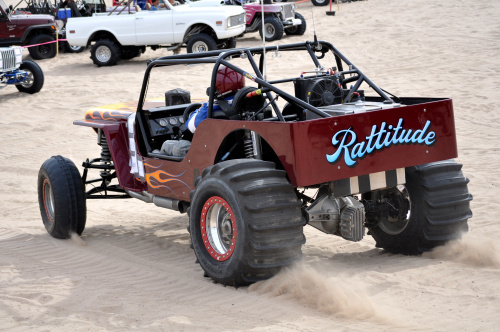 This left Dave Stidham’s “Grinch” Jeep & Nick Shultzman’s wild Blown SBC Altered to battle it out for first place. Unfortunately, carnage would catch up with Nick and Dave would take the win recording a 3.60. 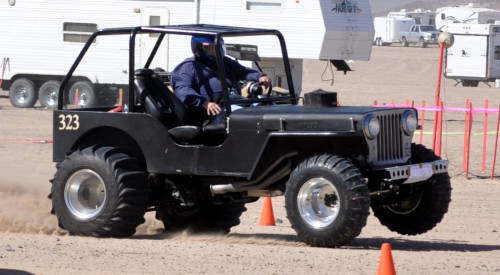 The X600 class was an Unlimited category with a 3.70 Index and it came down to Shawn Thompson’s “Terminator” Jeep against the “Money Shot” Jeep of Greg Den Hartog. 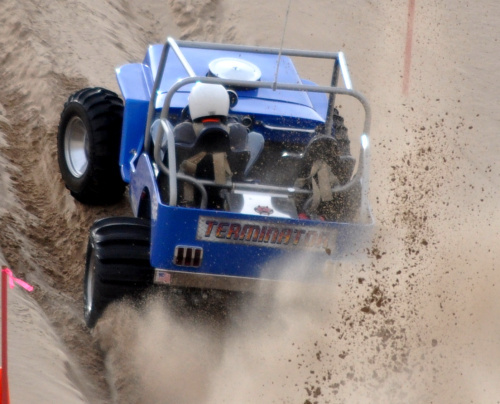 This race would be decided on the tree as Thompson went red handing the win to Den Hartog with a 4.26. 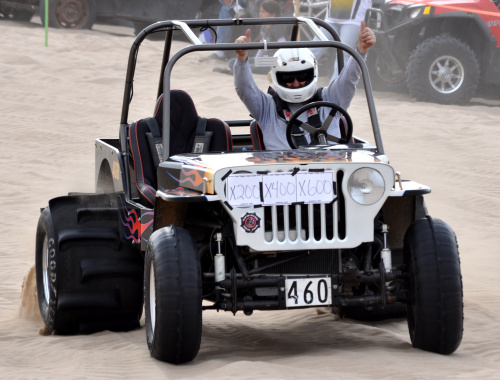 The X4WD category was a great battle between the two fastest 4WD entries on the weekend as Ken Allen’s white Blazer faced off with Jon Warren’s “Raspberry Thunder” Jeep. 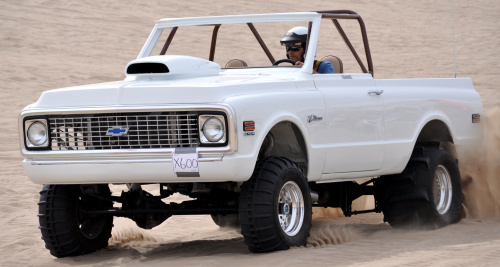 This would be a wheel-to-wheel battle with Allen’s Blazer turning on the win light in a 4.38 to 4.40 decision. 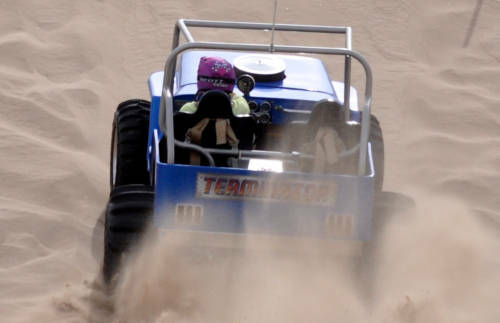 It was a Father-Son battle in the X400 (Big Block, No Power Adder) class as Greg Den Hartog came around for his second final round of the day in his Jeep against his son David’s Yellow & White T-Bucket. Greg would pick up his second win of the day in a great 4.31 to 4.31 decision. 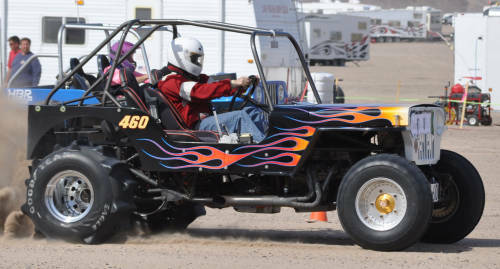 Shawn Thompson made it to his second final of the day, this time in the X200 (Small Block, No Power Adder) class against Wes Gilmore in his Larry Minor Motorsports Jeep. 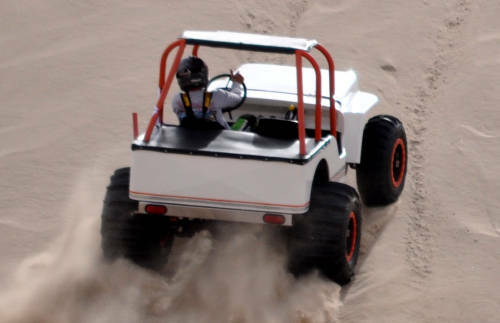 This race would be decided by mere inches at the finish line with Shawn taking the win running a 4.66 ET. The Duner class put on a great show. 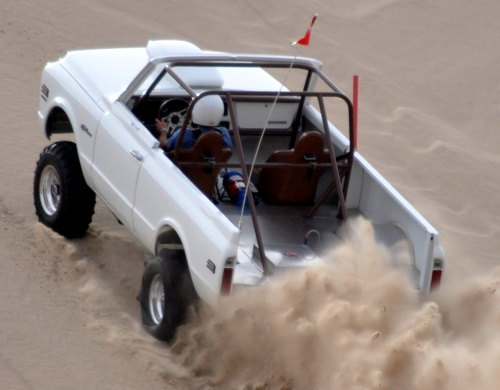 This category was for any full suspension, body vehicle with 2 seats running on a 4.3 Index. 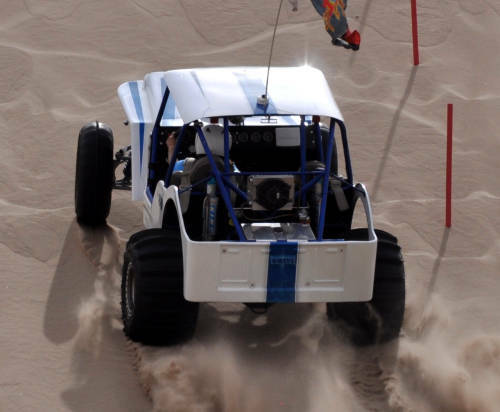 After some great racing, the final round came down to a battle between Jon Warren in his second final of the day against Chris Adamson’s “Bounty Hunter” Jeep. This was another race decided by mere inches with Warren taking the win 4.47 to 4.53. 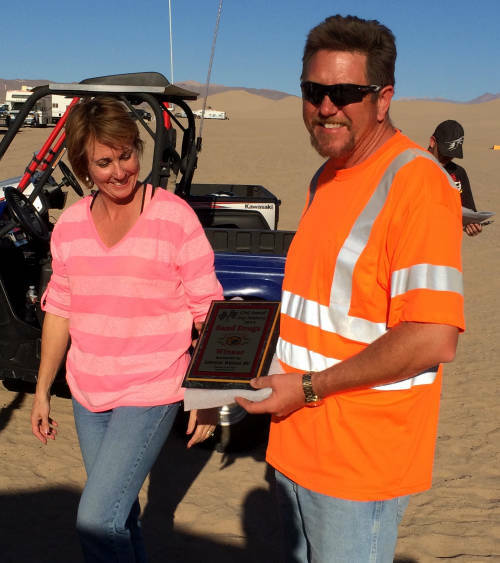 UTV class winners were Matt Hobson (UTV Modified) and Wendy Thompson (UTV Stock). 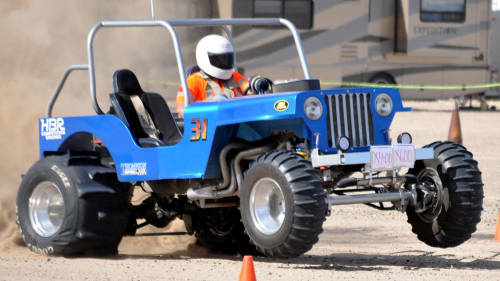 The Index classes added some extra spice to the class selection at this year’s Jeep Jamboree. 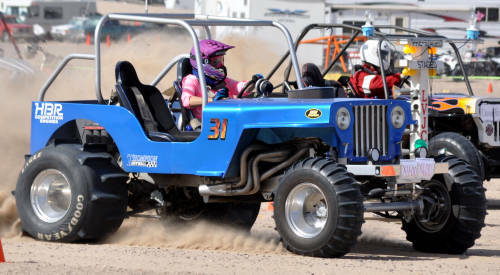 This gave racers more classes to enter and led to some excellent racing. 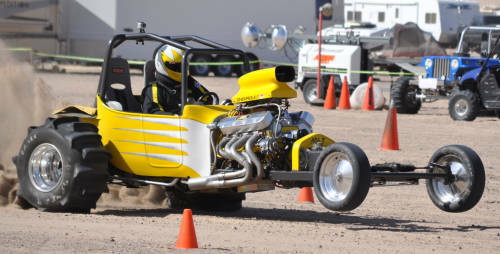 The Top Eliminator class was run on a 3.40 Index with the same competitors from the Pro Drag class entering as well. This would have the same outcome with Stidham taking the win recording a 3.71. 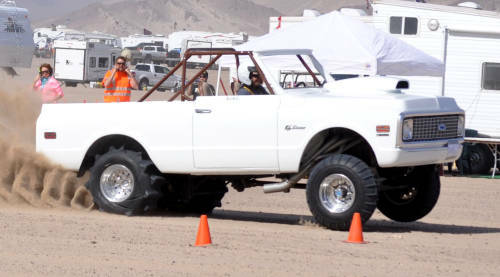 Pro 1 was run on a 3.80 Index, and David Den Hartog took the win in his second final round of the day defeating Frank Wagner’s Blown Jeep. 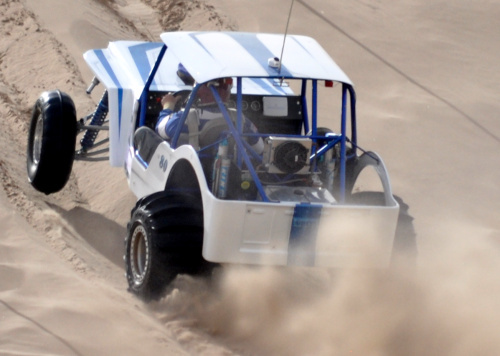 Ken Allen’s White Blazer took his second win of the day as he won the Pro 2 class (4.20 Index) over Charlie Owens in the “Terminator” Jeep. 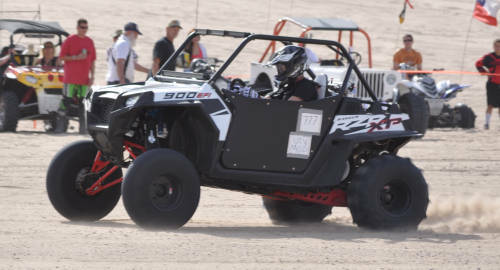 The “Bounty Hunter” of Chris Adamson took Pro 3 (4.60 Index) over Rick Humphries while Mike Wiliams rounded up the Index classes as the winner of Pro 4 (5.00 Index) running a 5.12 to defeat Eddie Spears in the final. The Women’s Heads-Up classes were full of action as usual. Wendy Thompson took the X600 & X400 victories over Debbie Gilmore while Gilmore turned the tables on Wendy in the X200 final. 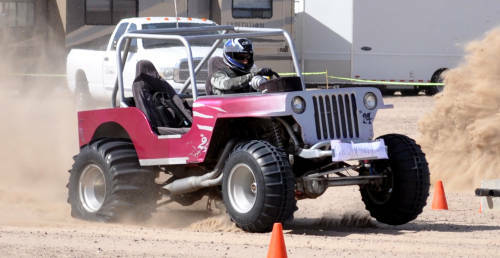 Debbie would then go on to defeat Jodi Rodriguez in the Women’s Duner final round with a 4.74. 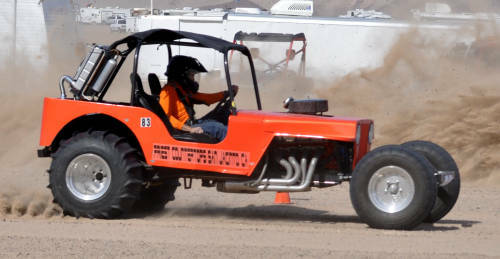 Ken Allen emerged victorious in the X600 (Unlimited) class on the Hill Climb edging Wes Gilmore for first class in this category. 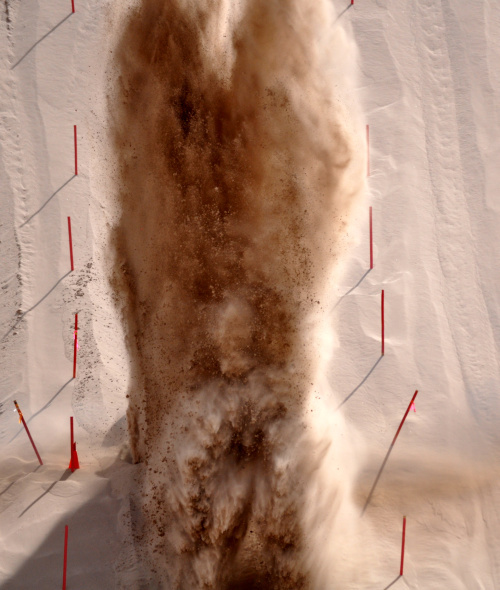 These guys put on a great show on a very tricky hill this year. The X400 (Big Block, No Power Adder) class was also hotly contested with Gilmore taking the win this time around as Chris Adamson took second. 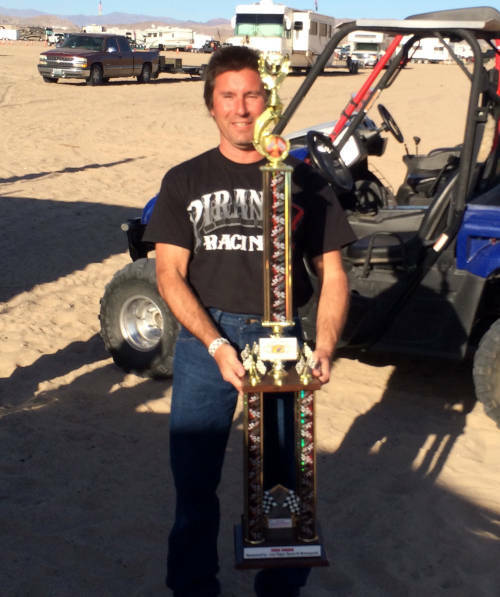 Adamson would then take the win in an Uphill Drag battle to settle the X200 (Small Block, No Power Adder) class over Shawn Thompson. 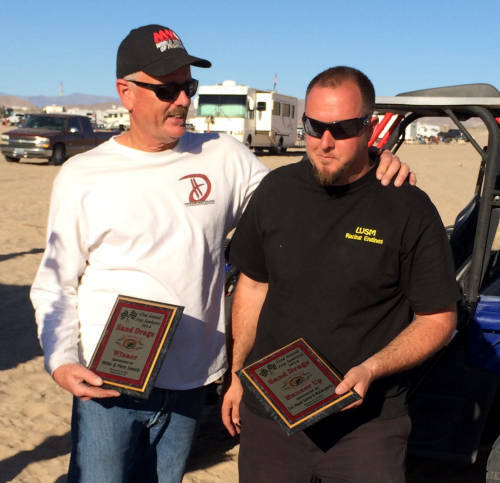 Jon Warren (X500 & A) and Jack Weddle (X300 & B) each took a pair of wins in the 4WD Jeep classes. 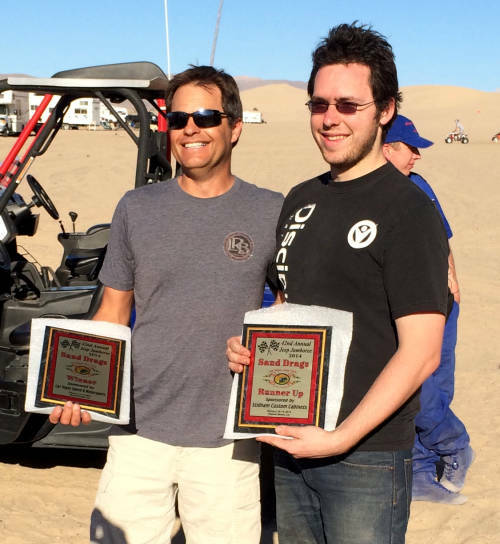 Doug Thompson took the F Jeeps class victory while Dave Stidham edged out Charlie Owens to win the UTV Stock category. 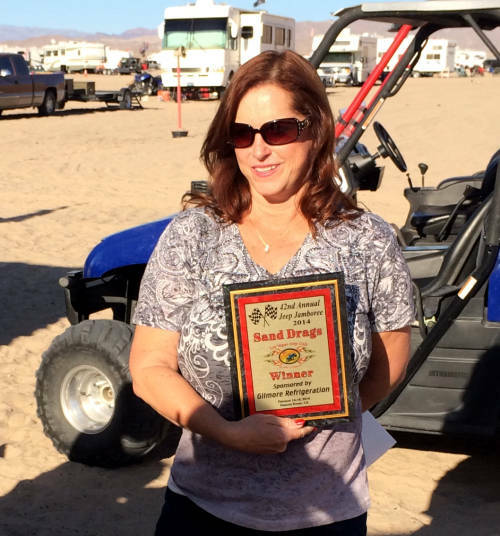 Debbie Gilmore and Wendy Thompson traded off wins in the Women’s classes as Debbie won X200, while Wendy won X600. 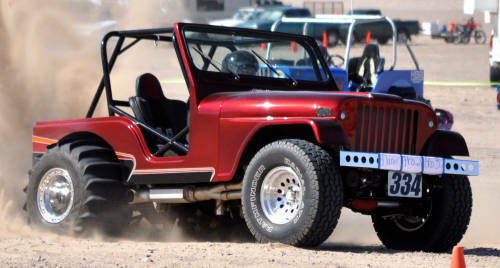 The Las Vegas Jeep Club presents several great specialty awards at each year’s Jamboree. 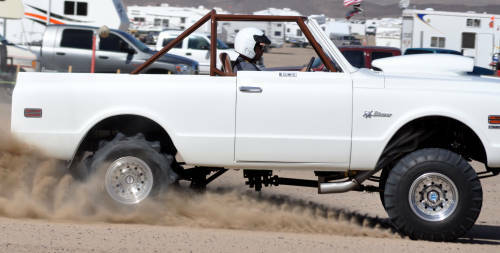 This year’s Best Engineered Award for vehicles that showed excellence across both the Hill Climbs & Drags events went to Chris Adamson & his “Bounty Hunter” Jeep. 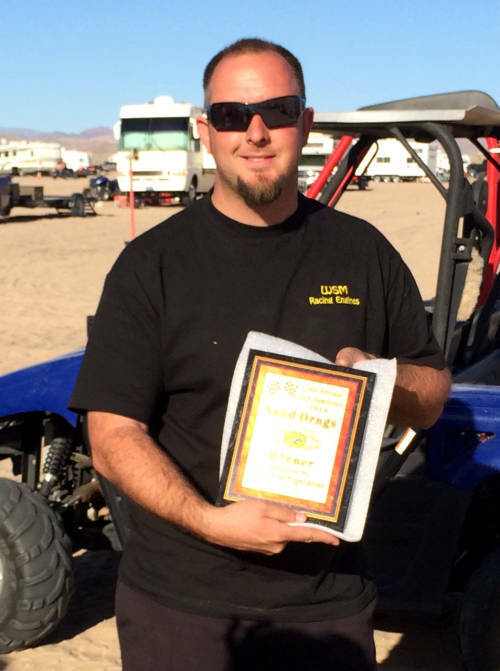 Chris took a win & runner-up in both the Hill Climb & Drag events as his Jeep ran flawlessly all weekend. 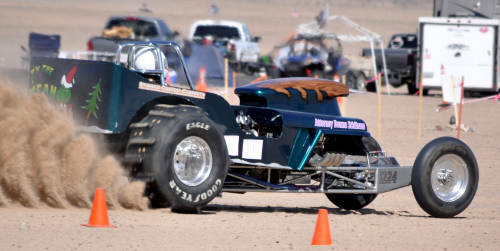 The Best Appearing award went to Frank Wagner’s great looking Black & Green Blown Jeep. 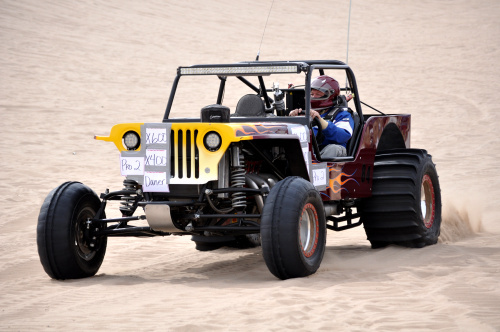 Frank’s Jeep also ran well as he took a runner-up finish in the Pro 1 class. 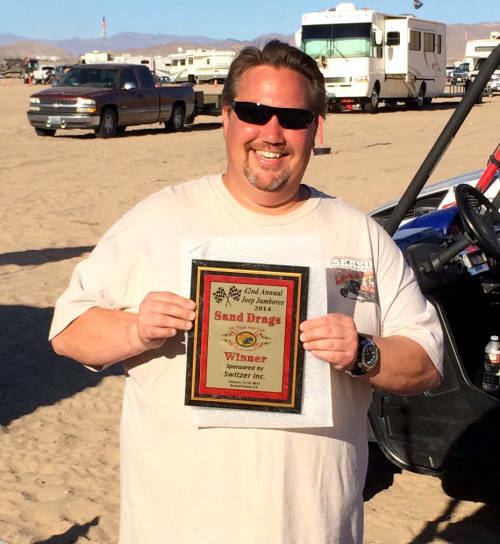 The Hard Luck award went to Nick Shultzman who wounded his blown small block powerplant badly in Pro Drag competition. The Fool’s Award for toughest mistake throughout the event was a tough one to decide as there weren’t any major mishaps on the track. 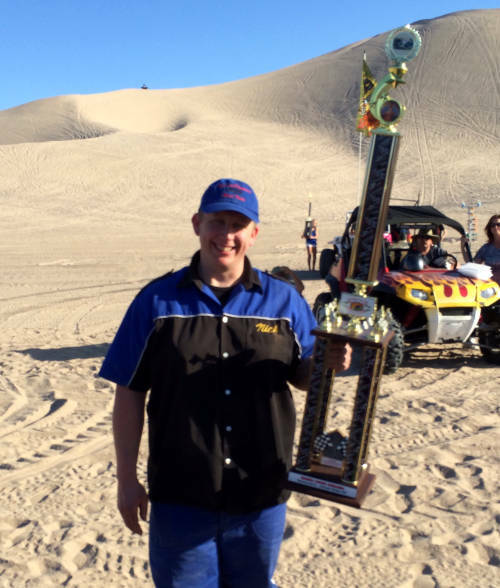 This Award ended up going to first time competitor Rogue Stillwater, who had a spill in the Dunes on his four-wheeler during a break in the Hill Climb competition. 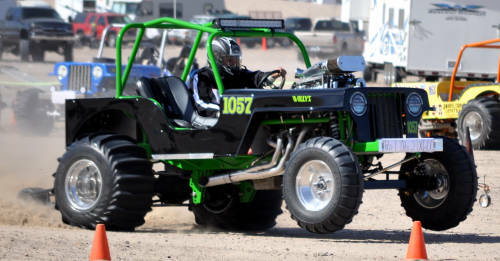 Rogue went on to record a second place finish in the Hill Climb event driving Eddie Spears’ Jeep. 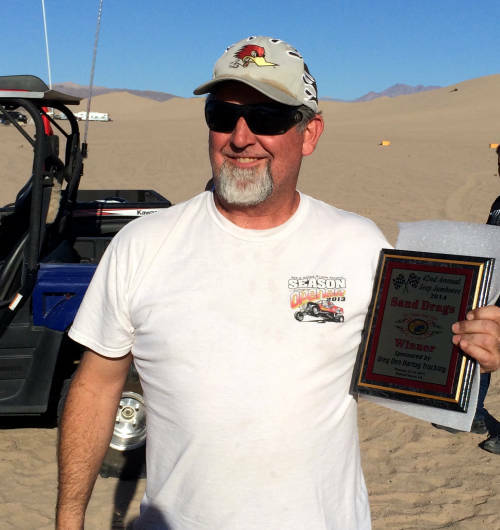 The Long Distance award went to Jon Warren, who brought his “Raspberry Thunder” Jeep to the event from Redding, CA.